Borussia Dortmund v Brugge was a match in which the Black and Yellows dominated every key stat with one exception, goals. Dortmund managed to play over 1000 passes throughout the match and had a pass completion rate of 93% but ultimately could not find a way past a well organised Brugge defence. Dortmund completed an incredible 930 of 1001 passes (93%) against Club Brugge. In fact, the longer the game lasted, the tighter the noose became that Dortmund strung around Brugge’s defence. But the Belgians showed fantastic discipline and on several occasions managed to get their neck out of the string that Dortmund were tying for them. Club Brugge were aided by the fact that Dortmund lacked aggression in the final third. 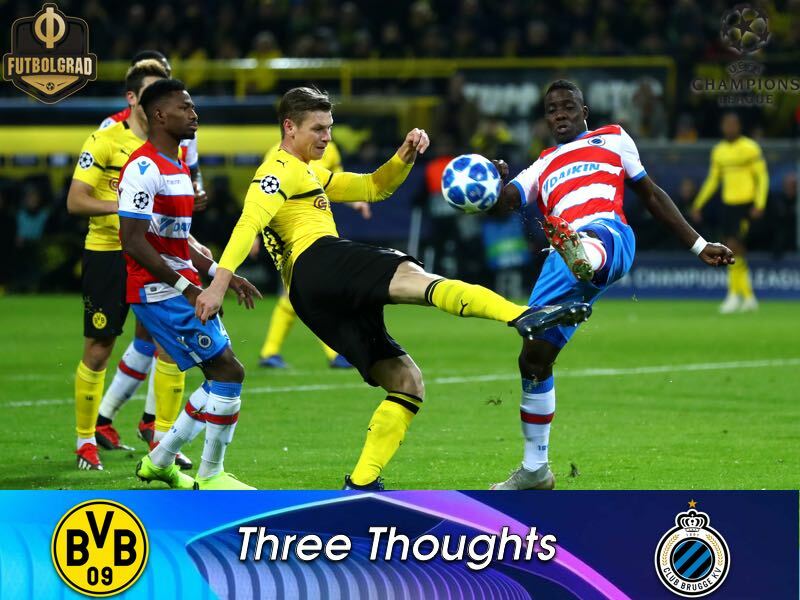 The Black and Yellows won just 45% of their direct duels and although Dortmund created 12 shots on goal – Brugge had five – only two shots hit the target. When Dortmund did get through they were unable to convert their chances. Only Christian Pulisic (10′) and Marco Reus (32′) created true goalscoring opportunities. Reus’ chance, in particular, would have changed the entire complexity of the game as Brugge would have had to open up their defence once they were down a goal. But untypical for the Dortmund captain, Reus missed the golden opportunity despite both room and time. Lucien Favre opted to start Guerreiro and Pulisic instead of the usual starters Jacob Bruun Larsen and Jadon Sancho. But whereas Pulisic was somewhat unfortunate at times and, like Reus, had a golden opportunity to change the fortunes of the match Guerreiro was completely harmless throughout the 73 minutes he was on the pitch. Like most of his teammates, the Portuguese national team player managed to complete over 90% of his passes but ultimately failed to penetrate Brugge’s defence on the left flank. To slow and static and his crosses ineffective, all four of his crossing attempts were blocked, Dortmund’s left side was lacking until Lucien Favre brought on Jadon Sancho for Guerreiro in the 74′ minute. 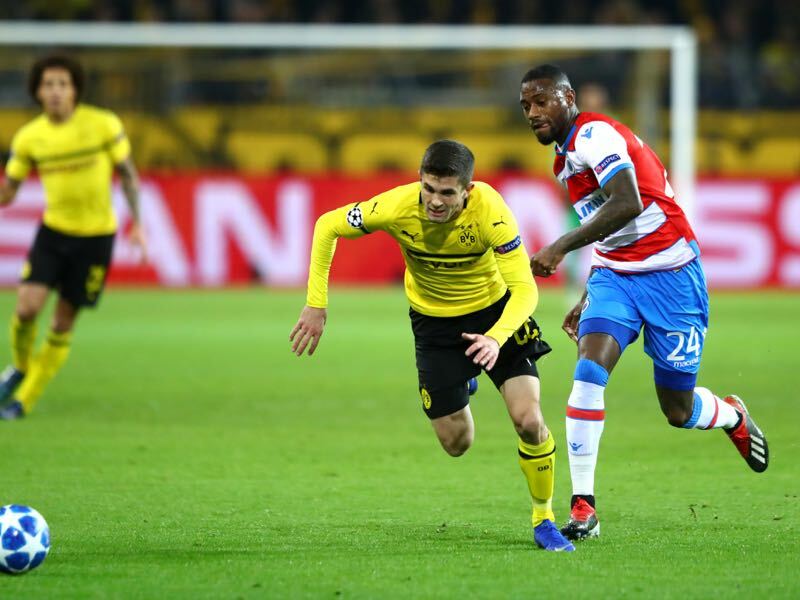 In Guerreiro’s defence it likely did not help that Abdou Diallo seemed to struggle with fitness throughout the 80 minutes he was on the pitch. Fielded on the left behind Guerreiro Diallo lacked the speed to push Guerreiro further up the pitch. It was a similar story on the right where Pulisic was industrious but somewhat lacked the spark to get his side going. In his defence, however, it has to be said that Pulisic did complete six of his eight dribble attempts and that he won 11 of his 20 duels. What seemed to be lacking in his department was an outlet for the final pass. Perhaps in this department, it is a tactical matter as Pulisic does not yet have 100% chemistry with Reus and Paco Alcacer, who started but without service was completely shut down. For the second time in a row, Dortmund have struggled against Brugge in the Champions League. After the defeat to Atlético Madrid, it was also the second time in a row that Dortmund have dropped points in this competition. Overall, it might be still a bit too early to say that Dortmund are decoded. But what becomes apparent is that the Black and Yellows struggle against certain opposition. Dortmund seem to, in particular, struggle against three-man or five-man defensive lines. In that setup, Dortmund struggle to create room on either wing, and it is no surprise that Brugge used that lineup against Dortmund. Previously, Hannover (0-0), Hoffenheim (1-1) and Hertha (2-2) managed to take points off Dortmund by employing five in the back. Even Augsburg (3-4) and Mainz (1-2) gave Dortmund some trouble employing that sort of tactical setup. “The opponent needs to do the work for us, and we need to play faster and more direct,” Axel Witsel said after the match. The problem, however, is that Favre’s football is in many ways focused on a patient buildup play designed to find the crucial opening that can lead to the breakthrough. That gets us back to point one, efficiency. Against opponents like Brugge Dortmund need to put away their chances like they did with great effect against Augsburg and Mainz.